The Lexus ES was manufactured from 1992 to 2003 by a division of its parent company Toyota Motor Corporation. It was more comparable to a Camry in the beginning as opposed to the high tech LS model. However, the ES generated great interest as an affordable, entry level luxury sedan. When shopping for a used Lexus ES you should have a good selection of vehicles to choose from given its popularity through the years. The initial offering of the Lexus ES was from 1992 to 1996. In these model years a used Lexus ES will normally come equipped with a 3.0 liter, V6, 185HP engine mated to a 4 speed automatic transmission. The interior will be nicely designed with walnut trim, automatic climate control and good sound system. From 1997 to 2001, a used Lexus ES will have an engine upgraded to 200HP, smoother styling and more luxury features. The last generation of the used Lexus ES lasted for just 2 years, 2002 and 2003. These model years had the same 3.0L, V6, but now capable of generating 210HP and paired with a 5 speed automatic transmission. Like its predecessors it remained a front wheel drive vehicle. This edition of the car offered standard amenities such as power front seats and one touch electric windows. It also came stock with 16 inch alloy wheels on the ground and a moon roof to top things off. 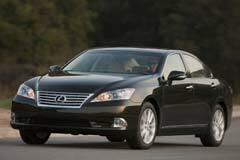 A used Lexus ES will afford you a well built sedan, with a roomy interior and a more than enough luxury for its price. 2014 ES 350 Lexus ES with 32467 Miles, for sale!